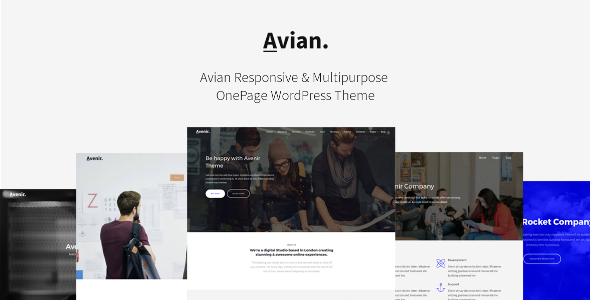 Avian is a Multi-Purpose WordPress theme, focused on minimalism, elegance and simplicity. Itâ€™s created with masonry portfolio grid. Packed with a lot of useful features, options and shortcodes. One Click Demo Installation â€“ Creating your website has never been much easier ever. If you would like to have your demo just like ours, all you need to do is just to click the â€˜One Clickâ€™ demo importer. With the help of the â€˜one Clickâ€™, your website will be seen like ours saving your time.You can also change easly any elements you wish on your website.